Begin your yoga practice by learning these easy beginner yoga poses. If you’ve considered trying some basic yoga poses—or even some advanced poses—you may have felt overwhelmed by the unfamiliar terminology, or simply not known where to start. While yoga can seem intimidating at first, it is truly an accessible and inclusive practice. Yoga is for everyone, regardless of body shape, flexibility, and fitness. Of all the yoga poses for beginners, this is a great place to start. At first glance, mountain pose might look like you’re just, well…standing, but it actually requires balance, postural alignment, and meditative focus. You might even say it’s the key to all classic asanas (yoga poses), making it perhaps the most important beginner yoga pose to learn. To begin, stand up straight with the inside edges of your feet parallel and hip-width (about four to six inches) apart. Spread your weight evenly through all four corners of your feet: the mound of the big toe, mound of the pinky toe, inner heel, and outer heel. Keep your pelvis in a neutral position (not tilting excessively forward or back). Align your hips over your ankles, your shoulders over your hips, and bring your head directly over your shoulders. Rest your arms at your sides. Your palms can face forward or toward your body, depending on what feels most comfortable to you. Broaden across your chest and collarbones. Press down into the four corners of your feet (also referred to as “grounding down”) and lengthen up through the top of your head. Soften your face and jaw. Cat pose is usually paired with cow pose for a mild warm-up sequence. Together, these basic yoga poses stretch and mobilize the spine, hips, and abdomen. Cat-cow is an excellent addition to the repertoire of foundational yoga poses for beginners. To begin, come to a tabletop position on your hands and knees, with your wrists placed under your shoulders and your knees under your hips. The folds of your wrists should make a straight line that's parallel to the top of your mat. Gaze a few inches in front of you and keep your neck long. For cow pose: Inhale, move your hips back, broaden and lift your chest, and raise your head slightly, coming into a gentle backbend. Next, flow into cat pose on your exhale by drawing your belly up and in toward your spine and rounding your back. Allow your head to drop toward the floor. Release by returning to tabletop then gently sitting back on your heels. Downward facing dog ( sometimes called “downward dog” or simply “down dog”) is one of the quintessential beginner yoga poses and an essential part of sun salutations. The pose gets its name—as you might’ve guessed!—from the way dogs stretch. If you exercise patience and listen to your body, it can be one of the most fun beginner yoga poses to learn. Begin on your hands and knees, making sure your wrists are under your shoulders and your knees are slightly behind your hips. The folds of your wrists should be parallel to the top of your mat. Spread your fingers out evenly. (But don’t force it! They won’t be spread as wide as they can be, just a comfortable distance apart.) Press your fingertips and the base of your fingers into your mat. Externally rotate your upper arms (i.e., spin your left upper arm to the left and right upper arm to the right). This can help to release tension in your neck. Be sure to keep the inner edges of your hands rooted as you do this (they can tend to lift up). If it feels comfortable, and you can keep your spine long, you can begin to straighten your legs. Breathe deeply and fully here. When you’re ready to come out of the pose, exhale, release your knees gently to the ground, and come to sit on your heels. Read about down dog modifications and variations here. Child’s pose is one of the basic yoga poses that you’ll explore in almost any class. 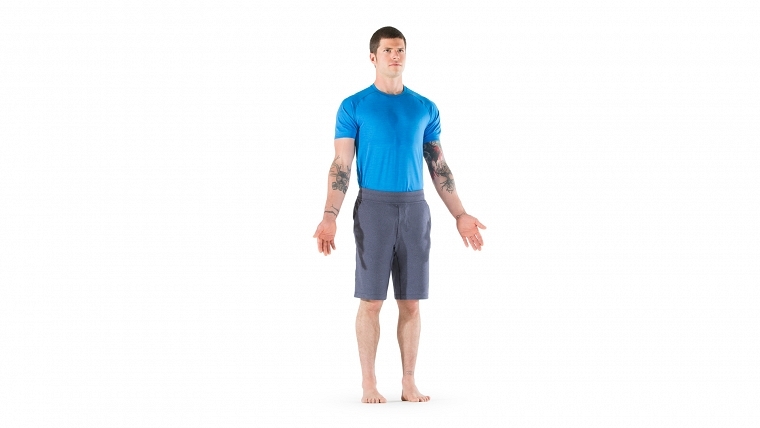 While it’s often used as a resting pose between more challenging asanas and sequences, it’s also a beneficial stand-alone posture. As you enter into child’s pose, bear in mind that it is also one of the best beginner yoga poses for consciously exploring the breath. Try to maintain breath awareness and notice where and how your body moves as you breathe. Start on your hands and knees, and take a moment to connect with your breath by breathing in and out through your nose, equalizing the inhale and exhale. You can spread your knees as wide apart as you’d like (keeping your big toes together as you do), or keep your thighs together if that feels more comfortable. Sit back gently on your heels. Reach your arms forward, or rest them at your sides, as you release your forehead to your mat. Relax into the pose and let your back soften, letting go of any tension in your shoulders, neck, and arms. Close your eyes if it feels comfortable to do so, and breathe softly here for as long as you’d like. When you’re ready to release, walk your hands back toward your hips and come to sit on your heels. Yoga International is an award-winning resource dedicated to yoga, meditation, and mindful living. If you enjoyed these five beginner yoga poses, continue to learn basic yoga poses with an online class, or try something new! With a Yoga International membership, you can start your own home practice today with beginner yoga poses taught by expert instructors. You can also learn how to correctly say Sanskrit pose names with our comprehensive pronunciation guide. Connect with us on Facebook or check out our customer reviews on TrustPilot. Start your free 30-day trial today and begin your journey with an active and caring yoga community.